Seen in the movie A Mighty Wind! This 21-chord Autoharp plays in eleven different keys. The patented chord bar configuration makes it easy to learn and to continue to play for years to come. This beautiful 1930’s reissue is truly a unique instrument. The classic design distinguishes it from all the rest. A true Oscar Schmidt tradition, this model gives a classic feel to a brand new instrument. “The Oscar Schmidt OS73C, OS73CE, and OS73B line of autoharps are a throwback to the 1930s. These autoharps have the appearance of older autoharps but feature the contraction of newer models. The Oscar Schmidt OS73 line of autoharps have been featured in various movies such as A Mighty Wind and Walk The Line. This is a great looking instrument that calls back to the heyday of autoharps. The OS73 is made from a combination of solid spruce and mahogany. The face of the OS73 autoharp is made from solid spruce and this will provide some great sounds. The backside of this autoharp is made from mahogany. This will help compliment the sounds produced by the autoharp. Mahogany is also a very durable wood. The OS73 line of autoharps also features a satin finish. The satin finish will help create a louder sound as the finish isn’t as think as a glossy finish. A couple of unique design features of the OS73 line of autoharps is instead of pin type bridge found on modern type autoharps, the OS73 features a traditional string bridge that the strings rest on. Also to keep with the heritage feel of the OS73 line of autoharps, Oscar Schmidt used “type A” strings. These type of strings were used on the original autoharps. They attach to the instrument using a peg and loop system. On modern-day autoharp they use “type B” strings. These strings have a ball at the end that fits into a slot on the bottom of the instrument. The OS73B is the 15 chord autoharp from the OS73 line of autoharps. It features the same construction as the 21 chord version. The chord bars on the OS73B are left uncovered and this is a throwback to the original design to the autoharp. The OS73C is the acoustic 21 chord autoharp in the heritage line of autoharps from Oscar Schmidt. The OS73CE is the acoustic and electric version of the OS73C. The OS73CE features a passive pickup in the body of the instrument. In prior electric autoharps from Oscar Schmidt, they used an active pickup to amplify the sound coming out the autoharp before it reached your amplifier. With passive pickups, you do not need a built-in battery tray. Passive pickups also produce a more organic sound from your instrument. Also, Oscar Schmidt removed the built-in equalizer so you can choose one of your to compliment your level of playing. When you purchase an Oscar Schmidt OS73 you will receive an instant $30 rebate on a hardshell case. We are also including a free digital tuner with every purchase of an autoharp. You can also upgrade to the 3 in 1 chromatic tuner with built-in metronome and tone generator..
AutoharpStore.com has everything you need to play your autoharp. We carry a wide range of books that can help you learn to play your instrument. We also stock all the strings and picks that you will need to play your autoharp. The OS73CE is a beautifully recreated autoharp based on the original design of the 1930s. This perfectly crafted autoharp features a spruce top with a black matte finished giving the autoharp the ability to produce a much louder sound. It also features a raised bridge which the strings rest upon. Because of the classic design of this autoharp, the strings are designed with a ring that goes over the pegs on the pin block. With the electric pickup, performers everywhere can play this amazing instrument and be heard over an amplifier. The mahogany back gives this autoharp added strength. The solid spruce resists splitting and cracking. The lengthwise grains are straight, close and dense which provide excellent support. The pin blocks in many of the finest autoharps consist of hard rock maple for extra strength. The pin blocks are laminated 10 ply rock maple pin blocks meaning they are specially coated for extra strength. The purpose of the pin block is to firmly hold the tuning pins in place where the strings are attached. The added strength of the laminated rock maple ensures that everything will stay in the right place. Multiple layers of maple laminations are cross-banded using a special high frequency, waterproof gluing process. Reversing the grain direction on each layer of lamination yields incredible strength and the high-frequency waterproof glue seals the laminations protecting the pin block from changes in the relative humidity. Important: This model does not fit in a semi-hard case or gig bag. It will fit in the hardshell case. Our products are brand new and are still in original package. They are stored in our temperature controlled warehouse to prevent any damage or warping. Our first-in first-out inventory system assures that you will receive the newest Autoharp available. We specialize in Oscar Schmidt Autoharps and accessories, so our time and energy is devoted to Autoharps. This allows us to provide our customers with the highest quality service and the best products available. We are an authorized Oscar Schmidt dealer, so you know that we offer the best products on the market. 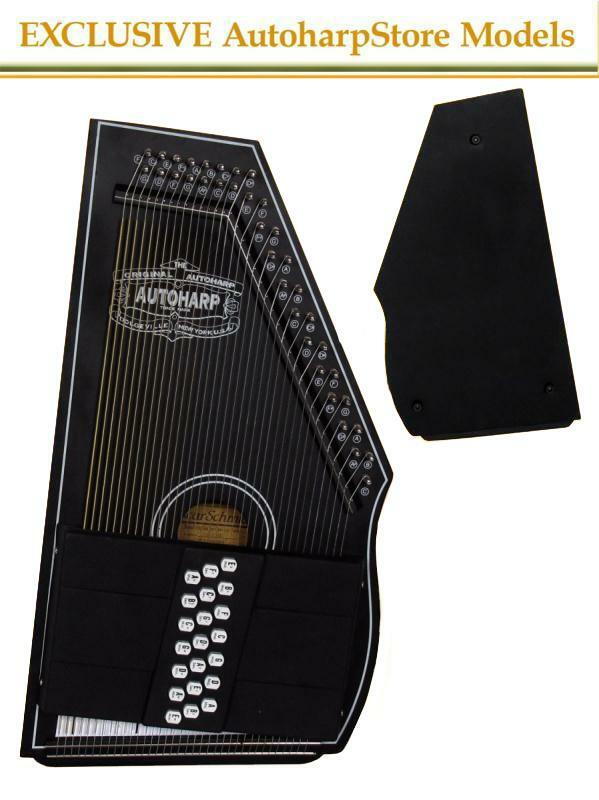 The AutoHarp Store makes it fast and easy for you to find what you are looking for. With our easy ordering system and same day shipping*, it is easy to order and arrives quickly to your door. In order to cut costs to offer our customers the lowest prices, we do everything online. Although most people would prefer to try out a product before they purchase it, by not having a showroom or storefront, we can offer the lowest prices in the market. We have a 30-day money back guarantee if for any reason you are not 100% satisfied. Then make your case selection on the next page! Learn more about each product by clicking on the tuner/case images below. This bonus promotion is for a limited time and only while supplies last! Added Bonus Promotion: Purchase an Autoharp by Oscar Schmidt from AutoharpStore.com and you'll have the choice of either a FREE Tuner (a $23.00 value) or take $20 off the 3-in-1 Chromatic Tuner. Simply add either tuner to your shopping cart to get your instant savings! The Autoharp is one of the few musical instruments that can claim to be truly American in origin. Invented in 1881 and patented in 1882, the Autoharp has had a remarkable hundred-year history. After being proclaimed “the nation’s favorite musical instrument” and then nearly fading into obscurity, the Autoharp has taken its manufactures on an endless roller coaster of ups and downs. As a nineteenth century parlor room favorite, it was finally replaced in popularity by the phonograph. The Autoharp did not die. It retreated to the mountains where it underwent a metamorphosis from a parlor instrument to a folk instrument. From there it came out into our schools to become a classroom feature, and finally has emerged as a popular instrument for the serious musician.